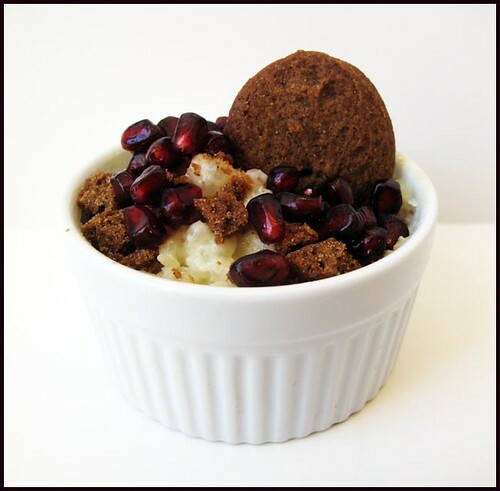 Some of my favorite toppings for this good old fashioned Tapioca pudding recipe are, fresh Pomegranate seeds and, crushed gingersnap cookies (bought from Whole Foods). This Smooth, sweet, tart, spicy, and crunchy combination is a real tantalizing treat for your taste buds. For this trio I prefer to serve my pudding warm. In a bowl, soak tapioca in 2 cups of room temp water overnight. Drain water. In a double boiler, heat milk just until no longer cold. Add salt and tapioca. Continue to heat until small bubbles appear at sides of pan. Cover, turn heat to very low and cook for one hour. Make sure the milk mixture does not simmer or boil. Separate egg whites from yolks. Beat egg yolks and sugar together until light yellow in color. Add a little of the hot mixture to the egg yolks and blend thoroughly. Then add the egg yolk mixture to the hot milk mixture, stirring constantly. Place the double boiler over medium heat and cook until tapioca mixture is very thick, from 15 – 30 minutes. Beat egg whites until stiff. Slowly fold the hot tapioca mixture into the egg whites. Stir in vanilla and serve warm or chilled. This recipe is from a packet of Reese Tapioca Pearls. Seed 1 large pomegranate. Crush 4 gingersnaps in a baggie and save 1 whole cookie for garnish. OH MY GOODNESS THIS LOOKS AMAAAAAZING......I can almost taste it!!! I have never made tapioca before and my husband keeps asking me to but now I will for SURE after seeing this!!! :)Thanks for sharing!